In Tiarn’ndaraj (Armenian Feast of the Lord’s Presentation to the Temple) Armenian families bake round gata (a pastry of Eastern origin made of flour, butter and sugar) with a special ceremony. (The holiday occurs close to the same time as Valentine’s Day and Carnival.) Armenian women are encouraged to put the love and warmth that they feel towards their family members into it, so that peace and success are present at their home the whole year. “Our ancestors used to bake gata in the tonir (a big jar dug in the earth in which fire is made, used for baking mainly Armenian lavash). The most interesting part is who gets the coin put in gata’s dough before baking’,” says 60-year-old Anahit Harutyunyan. A bit reminiscent of “King Cake” – popular among Mardi Gras or Carnival celebrants who search for the one small trinket while eating that pastry – a feature of the gata Tiarn ‘ndaraj experience is that a coin (or bead or button) is baked inside, portending good fortune to the one who finds it. “Earlier people used to put gata on a tray on the back of the youngest in the family, and only then they started cutting gata. Later they started eating it, and waiting impatiently to find out who got the coin,” Anahit says, preparing the dough of gata. She puts three teacups of flour on the table, adds a stick of margarine, previously melted. She mixes the flour and margarine with a knife until it becomes a homogeneous mass. She puts two eggs in the hole made in the center of the mass, and the dough of gata looks like an ox-eye daisy. Anahit keeps on mixing. “It is necessary to add little salt; we should always remember that any type of dough needs salt. And now we add a glass of matsuni (Armenian yogurt), where we have previously added a teaspoon of baking soda,” she says adding matsuni to the dough. Anahit continues mixing the dough with a knife. Then she puts the knife aside and starts kneading the dough. She adds some more flour to the dough with one hand and keeps on kneading it by the other hand. The process of kneading continues until the dough no longer sticks to the cook’s hands. “It is necessary to apply force while kneading the dough. After kneading it for some 15 minutes, we start pounding the dough with a rolling-pin. 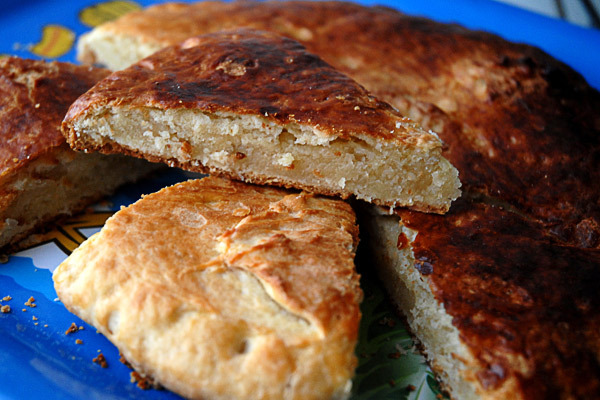 It makes gata more crumbly and delicious; it melts in the mouth while eating,” Anahit explains. After kneading the dough carefully, Anahit starts rounding the cut pieces of the dough with her fingers (which move very fast), making medium-sized balls. She says that the size of the balls depends on how big you want the final gatas to be. “Then we leave the dough balls to have a rest for 20 minutes. And meanwhile, we prepare khoriz (stuffing for gata), which we will put into the dough balls,” she says and starts preparing khoriz. She puts half a cup of sugar, a cup of flour, and 100 grams butter (previously melted) into a bowl. She starts mixing the mass with a spoon until getting a homogeneous mass. She adds some vanilla at the end. She says that sweetness of gata depends on taste. Twenty minutes pass. Anahit spills some flour on the table, and puts one of the dough balls on it; after smoothing it down a little bit, she makes a hole in the center, and she stuffs it with as much khoriz as needed, gathering and raising the dough from the edges and sticking them to each other. Khoriz remains inside the dough. After smoothing it down by hand a little bit, we repeat the process (make a hole in the center, stuff it with as much khoriz as needed, gathering and raising the dough from the edges, stick them to each other). “If a dough ball is big, it is necessary to repeat the process three times. At the end we smooth down the dough ball stuffed with khoriz by hand, and spread some egg (previously whipped) on it,” she says and spreads egg on the surface of gata by the palm of her hand. Then Anahit pierces the surface of gata with a fork, later she makes some designs on it with the same fork, and puts it into a preheated oven (200C; 395 F). “Gata remains in the oven for at least 15 minutes, but it is necessary to be attentive: once the surface of gata reddens, it means that it is baked and it is high time to get gata out of the oven,” she concludes. Put three cups of flour on the table, add a box of previously melted margarine, mix it with a knife, add two eggs, some salt and continue mixing. Then add a teaspoon of baking soda to a cup of matsuni and whip it. Add the matsuni with the baking soda to the dough and continuing mixing. Then start kneading the dough by hands. Steadily add flour so that dough does not stick to hands. Knead the dough applying force. Pound the dough with a rolling-pin for five minutes. Then make two balls out of the dough and leave them to have rest for 20 minutes. Put half a cup of sugar, a cup of flour, and 100 grams butter (previously melted) into a bowl and blend. Add vanilla to taste at the end. Take one of the dough balls, after smoothing it down a little bit, make a hole in the center, and stuff it with as much khoriz as needed, gathering and raising the dough from the edges and sticking them to each other. After smoothing it down by hand a little bit, repeat the process. Make a round gata by making it flat. Spreads egg on the surface of gata by the palm of your hand. Pierce the surface of gata with a fork, later make some designs on it with the same fork, and put it into a preheated oven (200C; 395 F). Gata is ready when the surface reddens.